Let's meet the construction hiring manager. His name is Jim. He's all that stands between you and a high-paying construction job. He's also not calling you. Why do Jim and others like him seem to avoid you like an OSHA inspection? You've got experience. Credentials. When you're working, your bosses always love you. Answer: The trouble is your construction resume. Specifically, it's not specific. If you're like most, your resume is about as different as one darkened roadside from another. You need it to stand out like a dozen road flares. A construction resume example better than 9 out of 10 other resumes. How to write a construction resume that will land you more interviews. Tips and examples of how to put skills and achievements on a construction resume. How to describe your experience on a resume for a construction worker to get any job you want. Here's a sample resume for a construction worker made with our online resume builder. Construction Resume Example - See 20+ resume templates and create your resume here. What's the Best Format for a Construction Resume? Want to know the quickest way to get rejected? Pick the wrong format for your construction worker resume. The wrong resume format will bury your best qualities like a backhoe. Get your resume noticed instead. 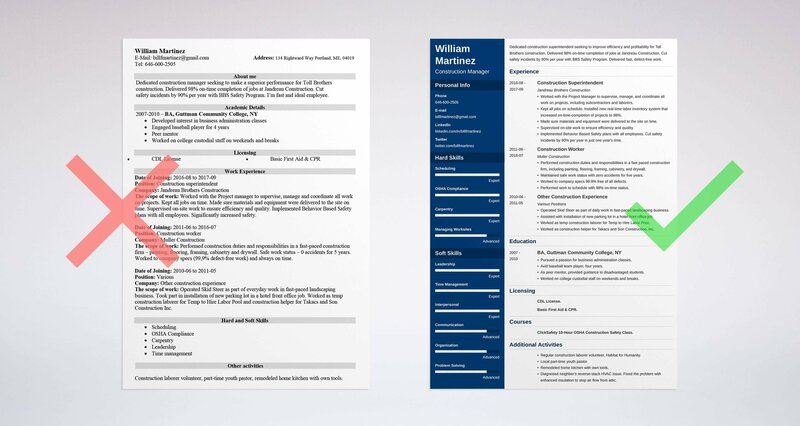 Pick a construction resume format that shows your best qualities fast. The reverse-chronological format is your best friend. It shows your last job first, with bullet points that catch the eye. Use clear, legible fonts, big headings, and white space in between to make your words pop out. Finally, save that general construction worker resume as a PDF. There's nothing wrong with construction resume templates for Microsoft Word. That said, PDFs don't scramble in transit like MS word resumes do. Just check the job offer first to make sure PDFs aren't banned. Now let's dig into how to write a resume for a construction job. Pro Tip: Use a spelling and grammar checker. An error-filled construction worker resume sends the wrong message about your talents. Want to see other professional construction resume formats? See our guide: "3 Resume Formats: How to Choose the Best One [Examples]"
That's how much time the average construction manager spends looking at each resume. But you can stretch that time out. By writing a good construction worker resume summary or resume objective. A good resume summary shows you're perfect to the job by citing your experience. Use it if you've got a lot. A construction resume objective shows your goal and passion. It works best for entry level construction laborers. If you do it right, you'll stick out like a gold coin in a mound of dirt. Dedicated construction superintendent with 7+ years construction experience. Seeking to improve efficiency and profitability for Toll Brothers construction. Delivered 98% on-time completion of jobs at Jandreau Bros. Cut safety incidents by 90% per year by implementing a BBS Safety Program. Delivered fast, defect-free work. Construction worker with 1 year experience as superintendent and more as a laborer. Skilled in scheduling and safety compliance. Also skilled in leadership and communication. That second construction superintendent resume sample blends into the rest like feathered spackle on a sheetrock wall. The first example makes the manager say, "Wow." An entry-level construction resume can look like a job site before breaking ground. You can fix it with a resume objective. A resume objective is basically a construction resume job goal. It doesn't have to show experience. But it's a lot better if you add some. Find it in past non-construction jobs, or do a little temp work. Hard-working construction worker, seeking to deliver fast, high quality work for Jandreau Construction. Have worked as Skid Steer operator, parking lot construction laborer, and temp construction helper for various construction firms. Commended five times by management for strong work ethic. Physically fit laborer seeking construction job. No direct construction job experience yet but I'm hoping to train on the job. That first general construction resume sample stands out like the Three Gorges Dam. Where did all that experience come from? Isn't this an entry-level resume for a construction worker? It came from construction duties in non-construction jobs and a few days of temp work. Pro Tip: Put your 1-2 most impressive accomplishments in your construction worker resume summary or resume objective. They're the lure that gets the manager to read the rest. Remember our construction hiring manager, Jim? For entry-level jobs, he doesn't care about experience in a construction resume. But what if you're applying for a higher paid position? Or writing a construction manager resume? Even if you're entry-level, showing your experience can be the thing that gets you hired. Experience is a VIP ticket. If you don't show it right, it's sayonara. Look at these two professional construction manager resume samples. Writing a senior construction manager resume? Need construction project manager resume examples? See this guide and skills based resume template. Worked with the Project Manager to supervise, manage, and coordinate all work on projects, including subcontractors and laborers. Kept all jobs on schedule. Installed new real-time labor inventory system that increased on-time-completion of projects to 98%. Made sure materials and equipment were delivered to the site with 99% on-time delivery. Supervised on-site work to ensure efficiency and quality. Decreased customer complaints by 45%. Implemented Behavior Based Safety plans with all employees. Cut safety incidents by 90% per year in just one year's time. Supervised and coordinated work on all projects. Ordered all materials and equipment deliveries. If you show a generic construction background, you'll get generic treatment. If you show specific experience, you'll draw the eye like a safety barrier. That first senior construction resume example doesn't just say, "I did XYZ." It offers concrete proof that's reinforced with steel. You don't need experience to work construction. But if you've got it, you can get a better job. The real trick? Everyone has experience. First: look at your past non-construction jobs. Ask, "What do construction workers do? And when have I performed those duties?" Then use those as your bullet points. Next: Do a couple days of temp work or volunteering. Search temp construction jobs online or ask around with friends or family. Operated Skid Steer as part of daily work in fast-paced landscaping business. Assisted with installation of new parking lot in a hotel front office job. Worked as temp construction laborer for Temp to Hire Labor Pool. Worked as construction helper for Takacs and Son Construction, Inc.
Commended by management 4 times for strong work ethic. Construction Experience: No construction experience yet, but I'm eager to do on-the-job training. Both residential construction resume samples above come from the same person. Neither has a construction background. Pro Tip: Don't put every piece of experience in your construction laborer resume. Just use the best achievements that fill one page. Remember, it's a commercial, not a Kevin Costner film. Keep the hiring manager on task with free construction resume action words. Use the ones in our guide: "+80 Examples of Resume Action Words for Every Profession"
"Construction workers don't need education." That's like saying a Bragg crane has so much power, it doesn't need a hook. Any section in your construction worker resume can be the hook that gets you hired. Then add details that fit the construction job description. Let's say you're writing a general construction manager resume. Pursued a passion for business administration classes. As peer mentor, provided guidance to disadvantaged students. Worked on college custodial staff on weekends and breaks. Avid baseball team player, four years. That first example gets the hiring manager to say, "This guy can get 'er done." Writing an entry-level construction helper resume? Use high school bullet points to get the job. Pick "wins" like sports teams, classes, or clubs that show construction qualities like work ethic or physical fitness. This works even on a welder resume. Pro Tip: Make your bullet points match the job offer in some way. The good ones above show leadership, physical fitness, and a strong work ethic. To make your construction worker resume blaze like a jobsite light tower, see this guide: "How to Put Your Education on a Resume [Tips & Examples]"
Let's peek in again on our construction hiring manager, Jim. He's drinking a black coffee as big as a jackhammer and about as powerful. He's also digging through 300+ professional construction worker resumes. He wants you to have every skill in the industry, right? Skid Steer driving, CDL, drywall hanging, well drilling, and all the various construction job titles. In fact, he only wants the skills that fit the job. That makes your life a whole lot easier. Last, prove you've got the skills in your construction laborer resume bullet points. Picture a construction worker job description seeking skills in speed, quality, flooring, framing, and drywall. Performed construction duties and responsibilities in a fast paced construction firm, including painting, flooring, framing, cabinetry, and drywall. Maintained safe work status with zero accidents for five years. Worked to company specs 99.9% free of all defects. Performed work to schedule with 98% on-time status. See that? That resume is anchored to the job offer like a 40-ton bridge piling. Notice how we added "safety" too, even though it isn't in the offer. That's because safety is important in a resume for construction jobs, even if the posting didn't mention it. Here's a list of skills for a construction laborer resumes. You'll need to find more in construction job offers online. Also, look into your own past to find others. Follow the steps above, and you'll tear into the job like the Big Dig under Boston. Pro Tip: There are a thousand construction skills. Luckily, you only need to list the ones the hiring manager wants on a resume for construction. Want to build up your skills section? See the construction resume sample up top for inspiration. Also, see our guide: "+30 Best Examples of What Skills to Put on a Resume (Proven Tips)"
Remember the hiring manager, Jim? If you want him to ignore you, make your construction resume like all the others. Be different. Do it with well-crafted "other" sections on your resume. There's a trick to this. Whatever "extras" you put on your construction laborer resume, make sure they show you've got the horsepower to do the job. Basic First Aid & CPR. ClickSafety 10-Hour OSHA Construction Safety Class. Regular construction laborer volunteer, Habitat for Humanity. Remodeled home kitchen with own tools. Diagnosed neighbor's reverse-stack HVAC issue. Fixed the problem with enhanced insulation to stop air flow from attic. See how those construction resume bullet points prove you're a good pick? They show safety, teamwork, construction experience, communication, work ethic, and problem-solving skills. Pro Tip: If you don't have a CDL, it's not a bad idea to get one. It only takes a few hours. Plus, it can get you a construction job in a nice, air-conditioned cab. Need more help to make the best construction laborer resume you can? See our guide: "+20 Best Examples of Hobbies & Interests To Put on a Resume (5 Tips)"
"Cover letters are a terrible idea." Bad construction cover letters are a terrible idea. But 40% of hiring managers consider cover letters mandatory. Write a good one for your general construction resume and you're halfway to hired. What's the most important thing to any hiring manager? So, make the cover letter about him. Second, mention a fact or two you like about the company. Look online to find those facts. Third, say how you can help. Look in the job offer to find the company's biggest need. Then cite a big accomplishment that shows how you can fill it. Fourth, close with a call to action. You can just say, "I'd love to talk with you." Pro Tip: Don't forget to follow up after a couple days. A well-timed thank you email can get your construction company resume a second read in the nick of time. Need a sample cover letter? Want to write the best construction cover letter you can? See this guide: "How To Write A Cover Letter [Complete Guide With Examples]"
You're making a big mistake with contact info. But you should also add a LinkedIn profile, Twitter handle, or other relevant social hangouts. There's an important step after the manager reads your construction resume, and before he calls you. That step lets the construction manager get to know you without picking up the phone. Don't have a LinkedIn profile? Make one with our handy guide. Pro Tip: Do some demo on your online presence. Don't let that New Orleans pic from five years ago take a wrecking ball to your chances. See our guide. Want more tips to build a professional construction resume? See our guide: "How to Make a Resume: A Step-by-Step Guide (+30 Examples)"
Read the job offer carefully. Highlight all the skills and requirements. Then put them in your construction resume bullet points. Prove your construction skills in your education and experience sections. This works in a construction worker resume or a construction management resume. Differentiate yourself like a mansion in a housing project. Add "other" sections to your construction manager resume. Do you have questions on how to write a great resume for a construction worker? Not sure how to describe your skills or achievements? Give us a shout in the comments! We'll answer as soon as possible! A complete guide to writing a painter resume. 20+ actionable examples and tips from experts. Use our sample resume for painting jobs.